Minimal change nephrotic syndrome in Hodgkin's disease. 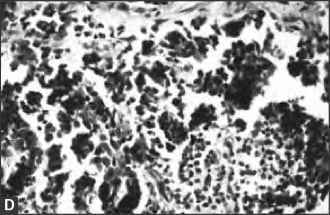 A, Light microscopic study of a renal biopsy specimen from a 57-year-old man with nephrotic syndrome of 3 months' duration. Urine protein excretion was 7.1 g/d. The serum creatinine concentration was 1.3 mg/dL. The patient also had cervical lymphadenopathy, biopsy of which revealed Hodgkin's disease of the mixed cellularity type. He was treated with irradiation to the upper mantle region with resolution of the lymphadenopathy. Proteinuria also declined to 2 g/d in 2 weeks and was absent in 8 weeks. The glomerulus was normo-cellular with delicate capillary walls diagnostic of minimal change nephrotic syndrome (PAM stain). 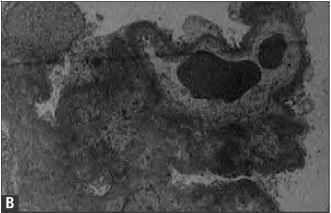 B, Electron microscopy of a glomerulus from the same patient showing glomerular capillaries with extensive effacement of the epithelial foot processes but without electron-dense deposits. of cases . 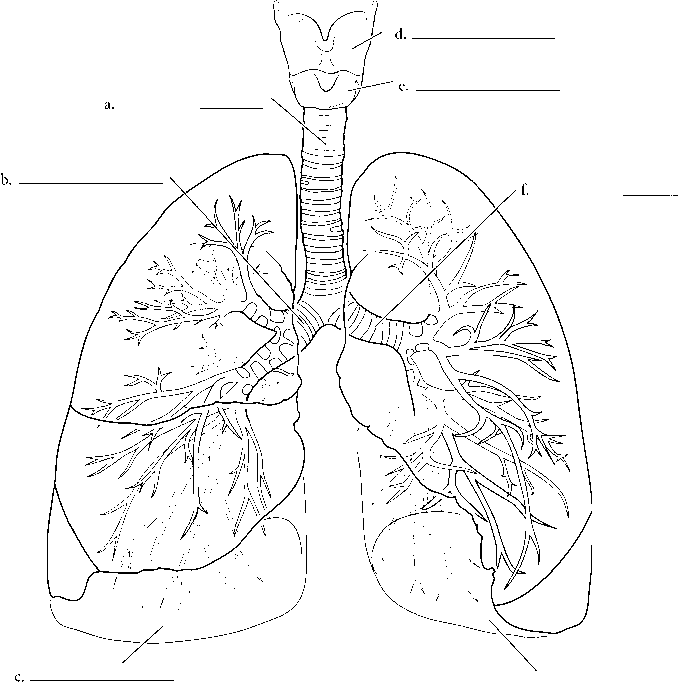 Although a variety of malignancies have been observed to be associated with membranous glomerulonephritis, the most common sites are the breast, the lung, and the colon. In some instances, the tumor antigen or antitumor antibodies have been detected in the glomeruli. Development of the nephrotic syndrome has been temporally related to the malignancy in several instances, and successful cure of the malignancy has led to a remission in the nephrotic syndrome. Relapses have been associated with reappearance of proteinuria . occurrence of glomerular diseases has been noted [5,46]. Several his-tologic types of glomerular diseases have been documented in these instances; the most common type has been minimal change nephrotic syndrome . The glomeruli of these patients are normal on light microscopic study and are devoid of hypercellularity or capillary wall thickening. No immunoglobulins are noted in the glomeruli on immunofluorescence microscopy. On electron microscopy, effacement of the epithelial cell foot processes is the only abnormality present. Proteinuria has been noted to remit with cure of lymphoma (with use of surgery, radiotherapy, or chemotherapy) in some cases; relapses in nephrotic syndrome occur with recurrence of the tumor. This has been documented to occur several times in some patients . The pathogenesis of minimal change nephrotic syndrome in patients with malignancy remains unknown. It is possible that a cytokine or tumor cell product may be responsible for the increase in glomerular permeability with resultant proteinuria .